In my moonlighting as a blogger, I don't often come across a post about the fun side of the toddler stage. I fully admit I'm guilty of it too. Many of the text messages and brunch dates I have with my fellow mama friends involve some discussion of temper tantrums, nap strikes, and messy meal times. 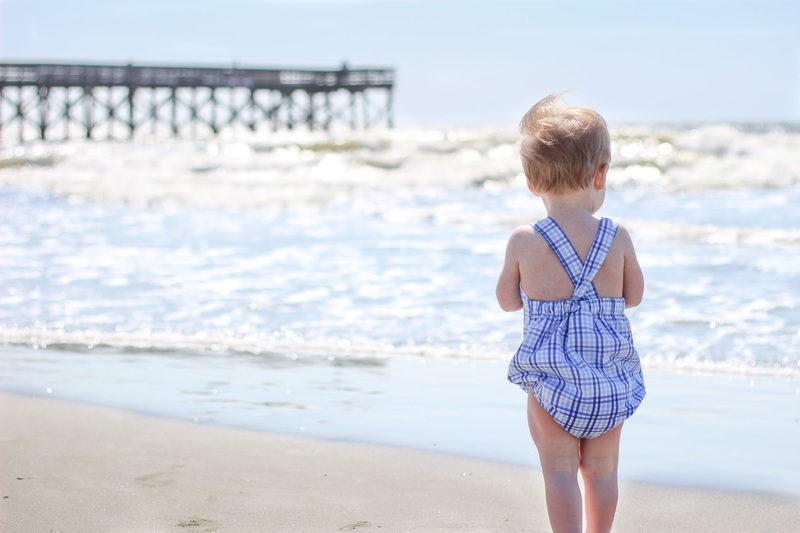 While I have no doubt we have only scratched the surface of the these toddler-isms, I've also learned sometimes I need to change my perspective. At the end of the day is it the violently refusing to eat anything but a cookie cake moment what I want to remember? No, thanks. But there are a lot of other moments throughout the day that I do. Motherhood has been a lesson in patience, especially, for me. Lets just say it is not my strong suit. Boy, are you a good teacher some days. In the beginning I could never have imagined how quickly you would catch on to things, from sitting to crawling, walking to sprinting. You've now learned to identify body parts, animals, and colors in the blink of an eye. I must give your daddy that "wow he is so smart and amazing" look a million times a day. You are trying to form words, and while mama and dada will go down as your first real words, we've enjoyed hearing the funny sounds that only parents can translate. My favorite is when you carefully pick out a book and plop down on my lap without any regard to whether you're actually going to indeed land on my lap. I love the brief but sweet hand holding, the way you "help" put clothes in the laundry bin, and the way you are constantly feeding me your food. I assume you think I'm starving enough to eat soggy animal crackers but I assure you that is not the case. I couldn't imagine the way my heart would swell when you do these things because it seems like yesterday we were applauding you for rolling over. I admit some nights I can't wait for you to fall asleep. There have been days where you've forced me to question my abilities as a mom and whether I've in fact lost my sanity for good. Or those days where you'd prefer to show me where my eyes are instead of closing yours. But most nights I have to coax myself into putting you in your crib. You look so perfect and peaceful in my arms and it takes me back to your newborn days when I couldn't bear to put you down. I'm so glad we ignored the baby books and rock you to sleep. It's only now when you are sleeping or sick when I get to cuddle you like I did in those early days. I have no choice in the matter, you're always on the go. Who can blame you when you've got playrooms to trash and Cheerios to crush? You leave a path of destruction in our house that I will gladly clean up at the end of the day because that means you were your happy and healthy self. These days are so fleeting, I promise not to focus on the tough ones. Lets do this, toddlerhood. So well written - sweet, raw, and heartwarming. You're a great mom! Aww I love this post, so sweet and heartfelt! I'm relieved to know the toddler stage has pleasant moments too. Ahh! This was so beautiful, Cait! Toddlerhood is tough but it is also so much fun!! So sweet; I love this. I love your mama heart and I say "preach" to every last word! Aw, I love this post! It is so true at this stage of the game that we mostly focus on the tough moments and days, when there are so many great memories being made! Such a wonderful post! I get so tired of reading blog posts about how hard it is with a toddler. All of us mommas have bad days, but instead let's focus on the good! To have a child is such a blessing!